With the experience of his previous work as leading member and arranger of Tower of Power it was a question of time, that Greg would build a new formation after the departure from this legacy in 1995. East Bay Soul is Greg's new group comprising today's of Smitty Smith (bass), Johnnie Bamont (sax and flute), Michael Paulo (sax), Joey Navarro (keyboards), Johnny Sandoval (percussion), Herman Matthews (drums), Sean Billings (trumpet, flugelhorn, trombone), Darryl Walker (vocals) and James Wirrick (guitar). Founded in 2009 the group already had some personal changes but the music is still the same since the release of the debut album East Bay Soul. The Getaway starts the album with a pompous arrangement like the entry of the gladiators. The massive use of horns and timbales creates a dominant acting. The Love Of My Life features singer Darryl Walker in a heartfelt ballade. Darryl has that certain timbre, which makes people keen. To Catch A Thief is the title of a 1955 romantic thriller directed by Alfred Hitchcock. Greg recommends his tribute as a cinematic movie score. The focus of the song lies in the development of a sophisticated melody. The energetic Back To Oakland is a reminiscence to the groups legendary show at Yoshi's Jazz Club. Following the path of Tower of Power the group presents a full horn arrangement. The fast paced Brassalicious delights the audience with a full impact of horn power. Once And For All features anew crooner Darryl Walker with an affective ballade soothing and emotional. What's Goin' On is meanwhile a national anthem interpreted by a legion of artists like Jason Miles, Till Brönner, Take 6, Everette Harp or Darren Motamedy. This song will certainly accompany us into the next century. On The Devil You Know the band expands to an explosive mixture of outstanding horns, while Darryl Walker rocks the scene. With Carry On trumpet player Greg Adams shows that he is still on the top of the game. His skills as composer and arranger doesn't need to fear comparison as well. The final song I'm Comin' Home is wonderfully interpreted by Darryl Walker and Greg's tribute to his beloved wife Andrea, who co-wrote the song. 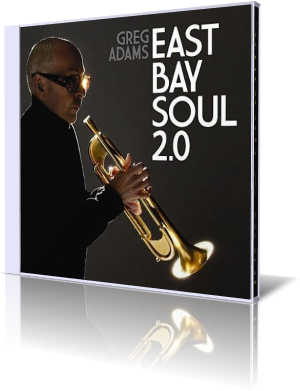 East Bay Soul 2.0 offers a broad range of styles from lovely ballades to smoking tunes. With such powerful funky horns and a singer like Darryl Walker this formation will certainly be talk of the town in the next years.